Developed from the wildflower Queen Anne’s Lace, the carrot has been cultivated for centuries in Europe. Rich in calcium, vitamin A, and fiber, carrots are very easy to grow and come in many shapes and sizes. Imperator carrots are the long, smooth, slim types found in supermarkets. Nantes carrots are slender in shape with rounded ends, or stump roots. 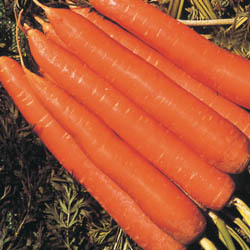 Chantenay carrots are broad at the top with a tapering shape and rounded end.